Part of the Skagit River Bridge collapsed when a tall semi-truck, driving in the wrong lane, struck its trusses. In May 2013, just outside Mt. 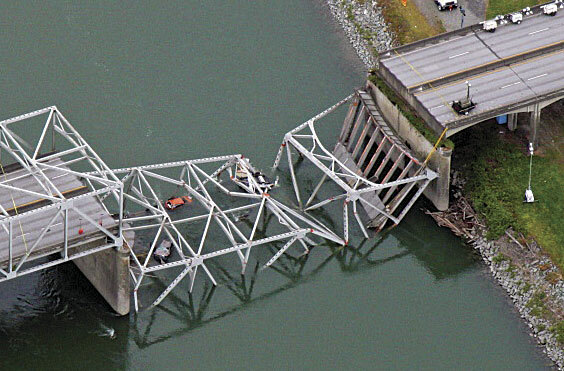 Vernon, Washington, a semitruck with an overheight load 15 feet, 11 inches tall struck the trusses of the Skagit River Bridge, causing part of the bridge to collapse into the water. The truck was traveling in the bridge's outside lane, which, at the edge, only had a vertical clearance of 15 feet, 6 inches. The inside lane, however, had a clearance of 18 feet. While the strike was not due to lack of signage or erroneous data, the National Transportation Safety Board recommended that the Washington State Department of Transportation (WSDOT) create a way for the public to have better access to its vertical clearance data through GIS. 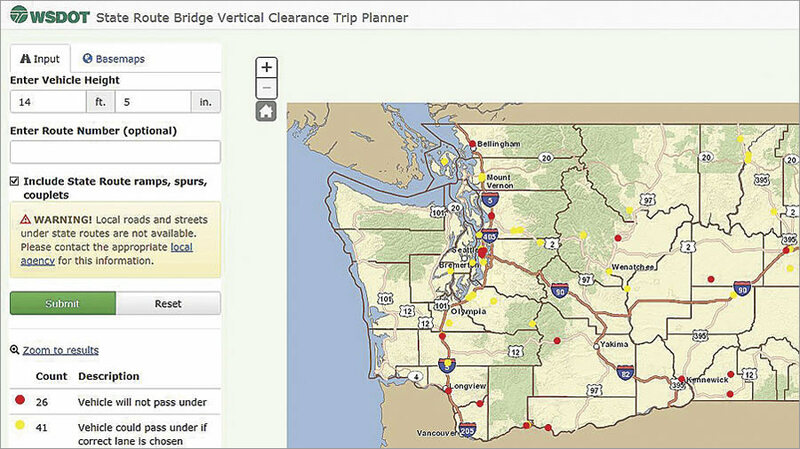 The resultant web map application, called the Bridge Vertical Clearance Trip Planner, gives the trucking community an effective and convenient tool for planning routes in Washington State. In the state of Washington, truck operators are responsible for checking proposed routes and ensuring safe maneuvers around any obstructions. Before WSDOT's web application went live, truck operators (or those applying for the permits needed to drive oversized loads through Washington) had to use the WSDOT Bridge List, a scrollable PDF, to locate all the crossings—bridges, overpasses, and underpasses—they would encounter on state-owned roads to determine whether they were passable. Operators then had to use their own paper maps to plan their main routes, alternate routes, and detours. The Bridge Vertical Clearance Trip Planner allows truck operators to easily see which crossings should be avoided. Now, with the Bridge Vertical Clearance Trip Planner application, truck operators can instantaneously see which crossings should be avoided or approached with caution. 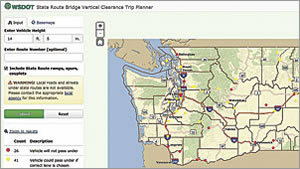 The map, displayed on the WSDOT website and accessible via ArcGIS Online, uses the department's bridge preservation database, which houses up-to-date information on vertical clearances and crossing locations along state routes. In the application, users enter the height of their load and, if they wish, a state route or an interstate number (including state route ramps, spurs, and couplets). Once users press Submit, the map legend shows the total number of vertical restrictions along the route and the map itself displays where those restrictions are located. Bridges and overpasses that are too low are marked with red dots, while cautionary ones that require a lane change for proper clearance are marked in yellow. 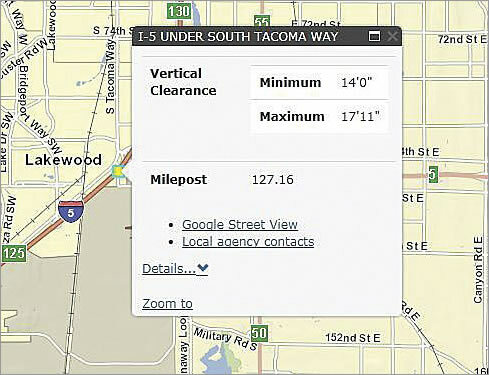 Users can then zoom in and click on the points to obtain more detailed information about each restriction, including minimum and maximum vertical clearances, mileposts, street-level images, local agency contacts, and permit information. Users can get detailed information about each restriction, including minimum and maximum vertical clearances. Putting the Bridge Vertical Clearance Trip Planner together gave WSDOT several opportunities to be innovative. For example, WSDOT's bridge inventory database supports crossing records—each instance where a state route crosses over or under another road—but not location geometry, which is the actual point of crossing. Additionally, multiple crossing records can exist for the same location, such as when a highway goes under a bridge (that's one crossing record for the bridge going over the highway and two crossing records for the highway going under the bridge in two directions). The vertical clearance measurements for each record are usually similar, but the route information is different. So WSDOT had to develop much of the data needed to support the GIS before adding it to the system. In some cases, one crossing record had to be split into multiple GIS events, while at other times, multiple crossing records were reduced to a single event. A procedure was also created to evaluate and merge duplicate locations onto a single point linked back to the original crossings. Once WSDOT compiled information for the more than 6,200 vertical clearance points in the state, the agency checked the data to make sure each location was correct and there were no duplicates. The legacy database was updated with additional tables that included the new geometry-to-crossing record relationships. Moreover, to ensure that the trip planner is accurate and up to date, an extract, transform, and load (ETL) process was developed to regularly update the new SQL database that supports the application. 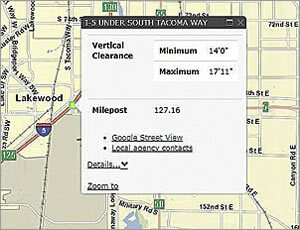 Working within funding constraints, WSDOT continues to expand the trip planner's functionality. A new tool is being developed to help the WSDOT bridge preservation team update bridge location geometry with an easy-to-use web interface that integrates with the department's Bridge Works software, which is used to manage inspection data. This tool may eventually be extended to cities and counties so they can maintain their bridge data. The Washington State Department of Transportation repaired the bridge, giving it 18-foot vertical clearance in all lanes. WSDOT is also looking to display lane-by-lane height, directional information, and city and county bridges in the trip planner. Additionally, the department has made its Bridge Clearances API available to third-party developers so they can use state-generated data to develop more tools to improve highway safety. By making vertical clearance information easier to access, WSDOT's ultimate goal is to help the trucking community make safer decisions while traveling across the state of Washington. As for the Skagit River Bridge, WSDOT crews completed repairs by July 2014. They replaced the collapsed span; raised and reinforced the remaining bridge structure, giving it 18-foot vertical clearance across all lanes; and retrofitted several trusses with reinforced steel components to add strength if the bridge is ever struck again. For more information, contact WSDOT's GIS and Roadway Data Branch manager, Alan Smith, at 360-596-8925.